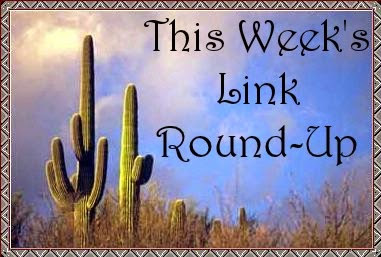 Since there's nothing to see here (ahem), I invite you all to take a look at the links I've rounded up for you this week! James Patterson's new imprint, BookShots, has sold one million titles. Game of Thrones has turned twenty. What college freshmen are reading. Keep track of what you've read with this scratch off poster. Harry Potter's twentieth birthday is being marked by a show at the British Library. George R.R. Martin's Wild Cards is in development at Universal Cable Productions. More London bookstores are going rogue as No Wi-Fi Zones. The Franz Kafka literary legal battle ends as Israel's high court rules in favor of the National Library of Israel. Archaeologists have discovered eighty shackled skeletons from a mysterious ancient Greek execution. The cruel beauty of Hieronymus Bosch: 500 years of breathtaking imagery. How the American Civil War built Egypt's cotton industry and changed the country forever. The 390-year-old tree that survived the bombing of Hiroshima. An ancient burial mound is revealing the role of women in "America's first city." This skeleton is the oldest known ancient Olympic athlete. Archaeologists have just uncovered one of the biggest Mayan tombs ever. Are archaeologists close to finding the Alamo's main gate? How nature helps us overcome trauma. The story of woolly mammoths' last stand on an Alaskan island. Mercury-laden sea lion carcasses are threatening California's coastal condors. You'll never believe what this chicken broke into a house to do! Some photos of possums that should at least make you smile. Six real-world Harry Potter locations you can visit. How to visit nearly every national park in one epic road trip. Alnwick Castle in Northumberland, England. I'm a bit partial to the place. Not only was it used as a location for Harry Potter, not only have I been there, one of my ancestors was the steward there a few centuries back. Planning for the future of a park where the trees have one name. Let's visit The Wild Detectives bookstore in Dallas. Now that I've finished up in Dallas, I'm heading for Tubby & Coo's book shop in New Orleans. Find out why teenager Lavinia Ream spent thirty minutes with President Abraham Lincoln every day for five months. Since I was the age of ten, I've believed that Jim Thorpe-- one of the world's greatest athletes-- was robbed of the recognition due him. Great road trips in American literature. Five authors worth binge reading. Books a visitor ought to read to truly understand the American cities and regions where we live, work, and travel. Five women writers tougher than Hemingway. Twenty-five words for other words. Sixteen inspirational quotes from children's literature. Nine literary-inspired t-shirts that only book lovers will understand. Movies you didn't know were adapted from books►. Oh, I'm so glad you got your pool back, Cathy! Everything's just all that much better, isn't it, when things are back the way they're supposed to be. Now, if you'll excuse me, I have a Mayan tomb to explore! Glad you are back in the pool and Denis was so helpful. I love those birds. They look like doves, but what are they? It's wonderful that you see the birds in your yard and pool area. Thanks for the links; I've read a few, have to get back to them. 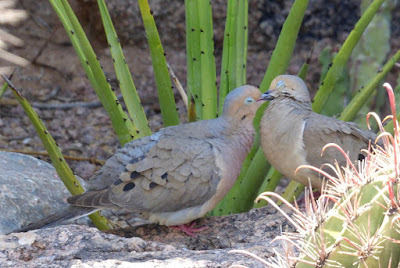 They are mourning doves, Kathy.